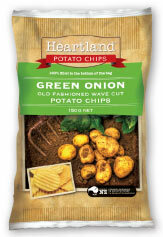 There are five types of Potato Chips companies; small, traditional, medium, home brand, and Frito-Lay. All have different approaches to packaging design, with variables within those approaches, such as budget, unique selling 'musts', and personal experience. A small company will either launch with the help of a design company or do some research and come up with a design themselves. The example on the left may or may not have been designed with funds thrown at it, but it simply does the job. It advertises the product utilising some selling points that are important to the company. Remove the text and replace it with, 'Garden Mulch' and it could just as easily be used for a variety of packaged goods that you may find at your local garden and landscaping store. A traditional company will eschew marketing philosophies and trends and just stick with what has served them well for many years. This approach can work for some, but for others a gradual decline in sales will lead to their disappearance or even aggressive buy-outs. The example on the left is very much of a company that survived for years, but closed for a while before being re-launched in recent times. The example on the left is of a traditional company that has been absorbed into a larger portfolio type company. Depending on the corporate culture of that company, there will be many variables to a marketing approach. In this instance, the brand is recognisable, so that becomes the main feature of the packaging design. The rest is modern, but bland. Many are stand-alone medium sized companies that have made it this far with innovative packaging designs and other unique selling points. Multi-national chain stores generally pay little to no attention to their packaging. While there is often a uniform theme for home brand products, they are almost always in the fortunate position of merely undercutting their shelf rivals - the design is fairly irrelevant. The example on the left is of a home brand that outsells all but one specialist Crisps manufacturer. The design is clearly awful. Just as Lady Gaga has a team of publicists, managers and stylists following her around, and Rafael Nadal has a nutritionist, a physio, a trainer, and whoever else makes up a world class sportsman's entourage, the big boys in the Chips & Crisps world can afford to pay design companies loads of money to do something you or I could do with Coreldraw or Photoshop. An agency of well paid folk will of course tell you that these infinitesimal alterations keep their clients ahead of the game. The fact that we already know that in the 2014 re-launch (every three years) the above variety will feature a pepper, some Chips, the logo and a giant arrow, suggests they may have a point, however smug they might look in their pink rimmed glasses. 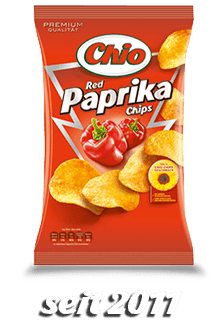 Imagine the panic if Chio owners, Intersnack, said, "Actually, we want a complete re-design..."
Next - Crisps in Outer Space!